We offer an extensive collection of Milk Silos for our clients. These Milk Silos are highly durable in nature. These Milk Silos are fabricated by using high-quality metal in order to ensure reliability and durability. 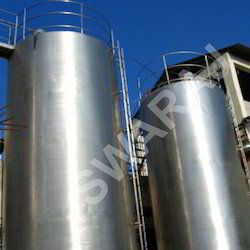 These Milk Silos are widely used in industries like food processing which requires milk for processing food items. These Milk Silos are manufactured under the strong guidance of expert professionals. Quality undergoes tough check so that the products delivered are of excellent quality. Looking for Dairy And Food Processing Equipments ?